Twelve years ago, Laura Saunders, owner of Inman Park Pet Works and the Krog Street Pet Works kiosk, came to Atlanta from Los Angeles looking for a change of pace. As she puts it, “Although it’s pretty, LA is really not my lifestyle. It’s just too Hollywood. Not that Atlanta’s not Hollywood. It came with me,” she jokes, referring to the city’s reputation as the Hollywood of the South. 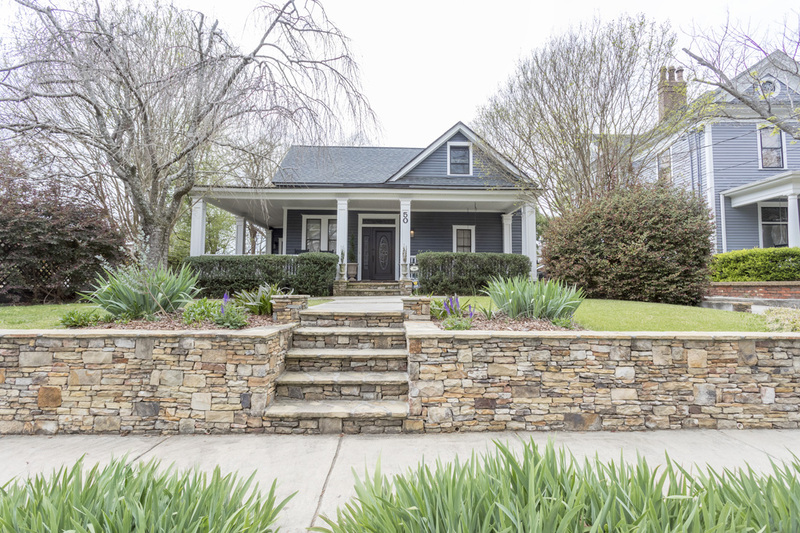 Her parents moved to Atlanta 25 years ago, and when visiting them, she took the Inman Park Tour of Homes. “The house” is a 1,965-square-foot, 1929 bungalow. 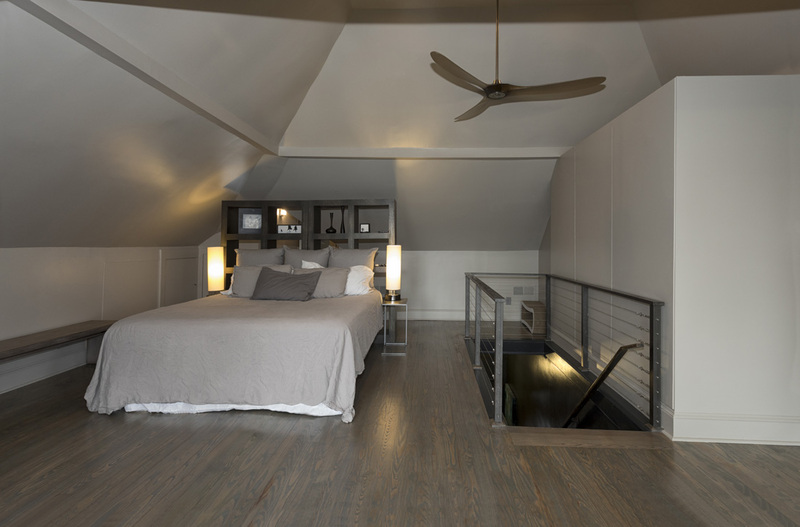 The original structure was one floor, but a previous homeowner added a second. 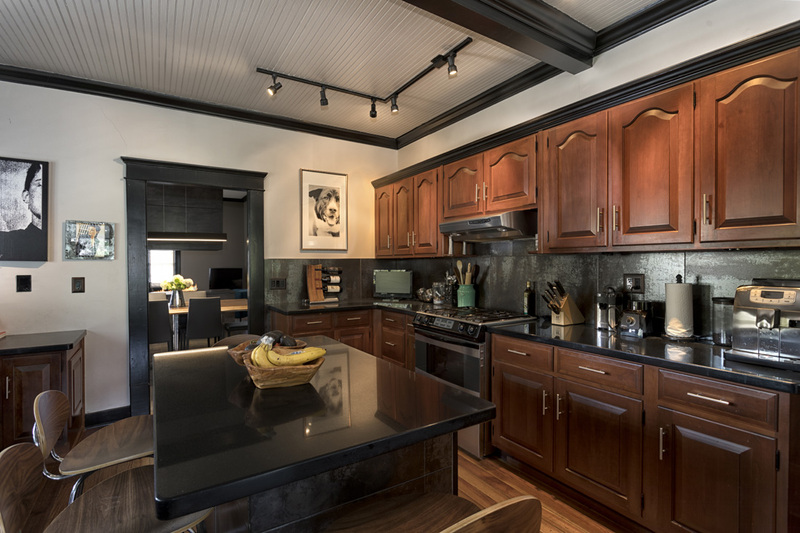 Initially, Saunders renovated approximately 25 percent of the space, including some in the kitchen, although she hopes to modernize that area a bit more. In 2015, she enlisted the services of Jeffrey B. Baker, design director of Jeffrey Bruce Baker Designs just north of Morningside-Lenox Park, to start on the rooms at the front of the house as well as the upstairs. Saunders did some initial kitchen renovations when she first moved in, but hopes to do more. When Saunders purchased the home, the front rooms were very small and closed off to each other, with the dining and living rooms separated by back-to-back brick fireplaces. Those were removed and replaced with a modern fireplace and wet bar that opened up the two rooms. The original powder room was cut down in size to improve its overall design. On the second floor, the balcony stairway and dormer windows were pushed out to create an additional 200 square feet of space. 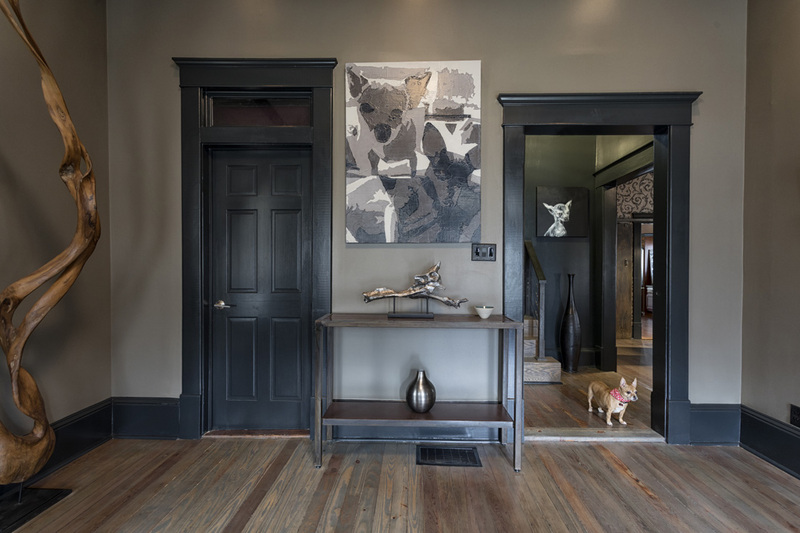 Saunders used art to add interest and texture throughout the home. One of her favorite things of the renovation is the downstairs fireplace. At first glance, it doesn’t look like a fireplace: It appears to be cabinetry and a wet bar separating the living room from the dining room. The burn unit rests in the bottom cabinet, so when lit, the flames rise up from it. When furnishing the house, Saunders searched for comfortable pieces that added warmth and enhanced the relaxing setting she had created. One example is the custom leather couch in the living room that she purchased from COCOCO Home in Buckhead. 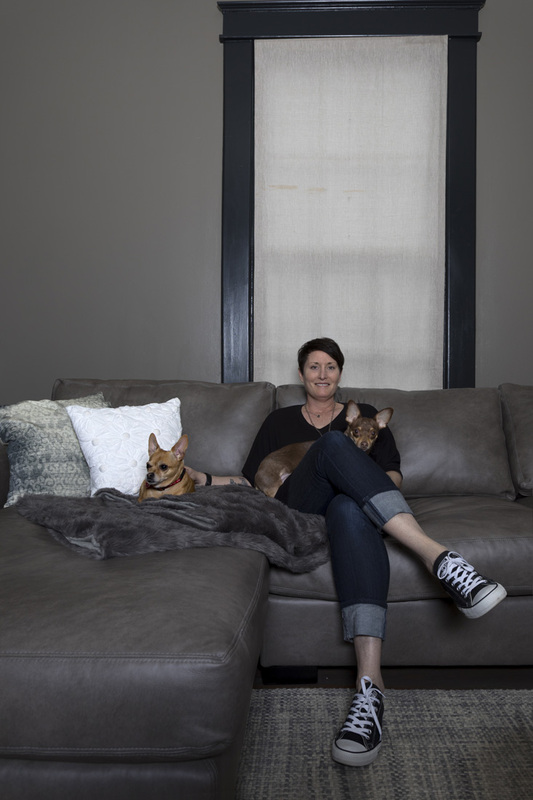 “I wanted a really big, cushy place to hang out,” says Saunders, who loves to do just that with her dogs, Belly and Olive. She complemented the couch with a blue chair from CB2, a cream chair from All Modern Design and a Cantoni coffee table. 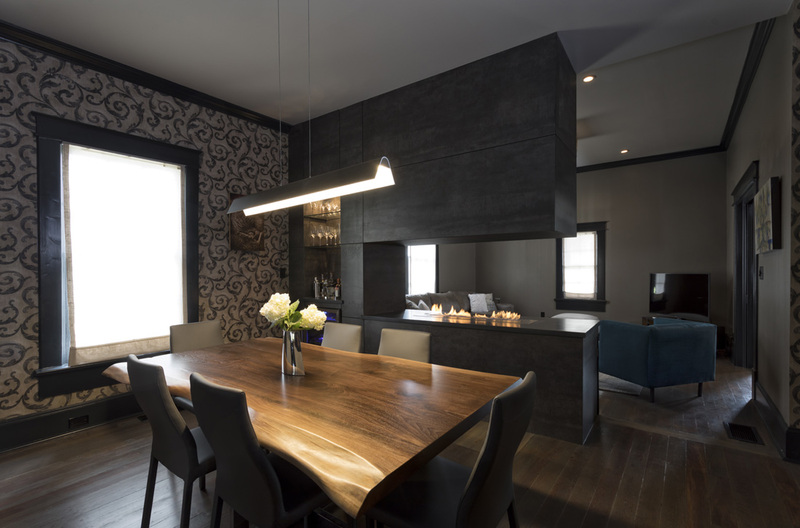 Baker designed the base to hold the custom-made, live-edge dining table. Saunders also had very specific ideas for the master bathroom. “I wanted a clean, big, modern, open shower area,” she says. The master bath now features a large double vanity topped by framed mirrors, along with the aforementioned shower. Saunders set her Sleep Number bed against a bookcase to create a unique headboard. 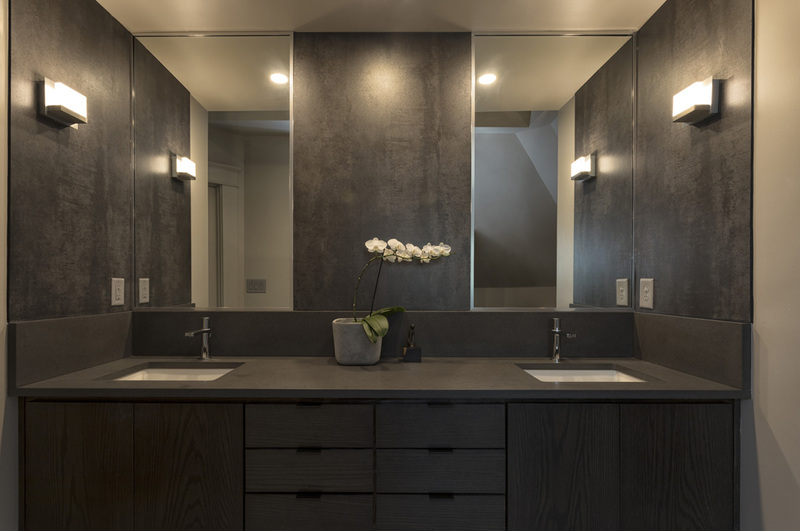 With its double vanity and dual mirrors, the master bathroom is now more open and modern.